Autism or Autistic Disorder (AD) was described for the first time by American child psychiatrist, Dr. Leo Kanner in 1943 as a pervasive developmental disorder. The main features of autism include impairment in three main areas of functioning: Social interaction; Communication; and Patterns of behavior interests and activities which become restricted, repetitive and stereotyped[2,3]. Although autism is a global disorder, relatively little is known about its presentation and occurrence in many developing countries. This may be due to insufficient parental and professional awareness of autistic syndrom disorder (ASD), in addition to the invalidity of early intervention services. Autism population experience few unusual oral health conditions, such as damaging oral habits including pouching of food, bruxism and self-injuries, in addition to dental trauma, which was reported in autistic individual with seizure disorder. Bhalla reviewed the literature and reported different views related to the dental needs of autistic patients. He concluded that, the majority of the autistic population studies revealed that caries susceptibility and periodontal disease prevalence were not so higher in autistic children compared to non-autistic individuals, however few studies reported an increased prevalence of caries susceptibility among autistic children, which may be attributed to the increased consumption of soft drink and sweet food in addition to the pouching of food due to inferior mastication abilitiesin autistic children. Sudan is a developing country located in north-east of the African Continent, little is known about the prevalence and oral health status of autistic children in all of the country. An organized oral health care for individual with special need at National or State level was not yet established. Therefore, the current study was conducted to describe the caries experience among a sample of institutionalized autistic children in Khartoum state. Moreover, the findings of this study regarding caries status can be used as baseline for appropriate planning of oral health services for autistic individual. The study population comprised of all children with Autistic Spectrum Disorder (ASD) attending the educational and rehabilitation Centers in Khartoum State. The total number of special needs centers were 53 as obtained from the directorate of special needs in Ministry of Education-Khartoum State. All of the head master centers were contacted through phone to identify the current available numbers of autistic individual. Only 10 out of 53 centers were found offering care for ASD children, however, two centers refused to inform the researcher about the number of autistic individuals or any required information relative to that population. Since the total number of children with ASD attending educational and rehabilitation centers in Khartoum state was so small (65 individual), therefore it wise to include all of them in this study. With the assistance of the headmasters at the autistic centre’s, a written approval were sent to the parents prior to starting the intra oral examination for their autistic children. The response rate of autistic’s parents was (45 out of 65). Data collction paper was filled for each child consists of demographic data (name, gender, age, mobile number, residence) and intra oral examination variable for detection of visible caries. The data was collected in the institute during the study days. All the clinical examination was carried out by the main researcher, an assistance was gained from the care givers to those children who showed uncooperative behavior. The clinical examination for carious status was performed in the teacher’s office, while the child seated on an ordinary chair under natural daylight using dental mirror and prob for visible detection of caries. Caries status was expressed by calculated of the DMFT/dmft indices according to WHO criteria to facilitate the comparison of the findings with national and international studies. Data was collected, summarized, coded and entered to the Statistical Package for Social Sciences (SPSS) program (version 17) in the computer. Specific frequencies and percentages were obtained for all questions. Means were used to describe the age and caries status (DMFT/dmft). The Chi-square test was applied for testing the statistical significance of different associations between gender, age and caries index. For all statistical tests a P-value of less than 0.05 was considered as significant. A total of 45 autistic children (34 boys and 11 girls) their parents agree to participate in this study and return back the consent form and 20 children’s parent refused to have part in this study. Boys to girls ratio in this study was 3:1, and the age group of the children ranged from 2 to16 years old (mean = 8.2 years) and it categorized into three main age groups (Figure 1). Table 1 shows the distribution of mean DMFT according to gender and age groups of autistic children. The total mean DMFT of the permanent dentition was (0.83 ± SD = 2.945) distributed as (1.0) and (0.33) in boys and girls respectively. All the children in the age group 12-16 years were boys; they exhibited highest score of DMFT (6.33). More or less an equal DMFT mean was obtained among both boys (0.30) and girls (0.33) in the mixed dentition age group. It was statistically significant with age (p - 0.004) in boys. In the age group 7-11 years old. In the deciduous dentition the distribution of mean dmft according to gender and age group was shown in (Table 2). The total mean dmft score was (2.4 ± SD = 3.842), it was noticed that boys had higher mean dmft (2.76) than girls (1.45). Boys in age group (2-6 years) exhibited the highest mean dmft (3.33), in contrast to the girls results in which no dmft was recorded (dmft = 0). No statistical significant differences was found in association to dmft and gender in the autistic . The highest percentage of decayed teeth (74.1%) was recorded for the mixed dentition age group (7-11 years). However, no filled teeth were reported among this age group and the majority of the filled teeth (80%) was recorded in the younge age group (2-6 years). The percentage of missed component was equal (37.5%) for age group (2-6 year and 7-11 years) old (Table 3). This is a clinical based study aimed to evaluate the carious status among a sample of autistic Sudanese in children in Khartoum state with regards to age, gender. Gender distribution of autistic children in the present study was 3:1 male to female ratio, which was consistent with previous studies among autistic population[8-10]. Where as, a ratio of 4:1 was reported among other autistic population[11-14]. The total mean of dmft and DMFT in the present study was found to be 2.4 and 0.83 respectively. The level of DMFT obtained in this study was (0.83) and it considered low when compared to the results obtained by Jaber in United Arab Emirates (2.4), and also by Chadha, et al. in India dmft (2.4). Slight increase in dmft (2.75) was reported by Murshid in Saudi Arabia autistic population[15-17]. In the present study the DMFT score when compare between genders revealed that, boys had higher mean DMFT (1.0) than girls (0.33), which in consistent with the results reported by Rekha, et al. in Chennai in which boys had higher percentage of dental caries than girls in all three dentitions stages. In contrast, previous studies performed in United Arab Emirates showed that the majority of girls experienced higher (4.4) mean DMFT value, also in Saudi Arabia the girls had much higher DMFT than boys (7.25 and 1.6) respectively, moreover the dmft in the deciduous dentition was vice versa 3.62 for boys and 1.0 for girls. The variation in the value of dmft and DMFT among different autistic population in the different countries may be partially attributed to the studied sample size, ethnic back ground, as well as the dental awareness among the parents and autistic population, and the dental care provided to those population in each study countries. The present study revealed that the DMFT score in Sudanses autistic sample was twice the DMFT recorded among normal Sudanese school children 12-year-old in Khartoum state. These can be due to the difficulty for assessing dental services for autistic children, in addition to the lack of special dental care center for autistic children in Sudan. • The small study sample size limits the generalization of findings to the broader autistic population in the whole country. • Un-cooperation of head masters of some autistic centers lead to a minimize the response among autistic’s parents. • Caries status may be under estimated due to the use of natural sunlight in examination room and the proximal caries was not assessed in the sample due to practical difficulty in transporting the children to the X- ray clinic. Although the autistic children had low level of DMFT/dmft compared to WHO classification, they had extensive unmet needs for dental treatment. 1. Kanner, L. Autistic disturbance of an affective contact. (1943) Nervous child 2(3): 217- 250. 2. Kenney, M.K., Kogan, M.D., Crall, J.J. Parental Perceptions of Dental/Oral Health Among Children With and Without Special Health Care Needs. (2008) Ambulatory Pediatrics 8(5): 312- 320. 3. Obaid, M.A. Parental Attitudes towards Autistic Child. (2012) European Journal of Social Sciences 31(1-3): 103-114. 4. Vijaya-Prasad, K.E. Always unique totally interesting some times mysterious–autism. (2010) Annals and Essences of Dentistry2(2): 62- 66. 5. Practical Oral care for People with Autism. (2009) National Institute of Dental and Craniofacial Research. 6. Bhalla, J.Autism and Dental Management. (2006) Ontario Dentist 83(6): 27- 29. 7. Oral Health Surveys- Basic Methods. (1997) World Health Organization Geneva (WHO). 8. Autism spectrum disorder, pervasive developmental disorders. (2008) National Institute of Mental Health. 9. Al-Salehi, S.M., Al-Hifthy, E.H.,Ghaziuddin, M. Autism in Saudi Arabia: Presentation, Clinical Correlates and Comorbidity. (2009) Transcultural Psychiatry 46(2): 340- 347. 10. Vishnu Rekha, C. P. Arangannal, P., Shahed, H.Oral health status of children with autistic disorder in Chennai. (2012) Eur Arch Paediatr Dent 13(3): 126- 131. 11. Abbasnezhad-Ghadi, B. Access to dental care for a selected group of children and adolescents with ASD (2010). 12. Zeglam, A.M., Maound, A.J. Prevalence of autistic spectrum disorders in Tripoli, Libya:the need for more research and planned services. (2012) East Mediterr Health J18(2): 184-188. 13. Samadi, S.A., Mahmoodizadeh, A., McConkey, R. A national study of the prevalence of autism among five-year-old children in Iran. (2012) Autism16(1): 5- 14. 14. Bakare, M.O., Ebigbo, P.O., Ubochi, V.N. Prevalence of autism spectrum disorder among Nigerian children with intellectual disability:a stopgap assessment. (2012) J Health Care Poor Underserved 23(2): 513- 518. 15. Murshid,E.Z. Oral health status dental needs, habits and behavioral attitude towards dental treatment of a group of autistic children in Riyadh, Saudi Arabia. (2005) Saudi Dental Journal 17(3): 132- 139. 16. Chadha G.M., Kakodkar, P., Chaugule, V., et al. Dental Survey of Institutionalized Children with Autistic Disorder. (2012) Int J Clin Pediatr Dent 5(1): 29- 32. 17. Jaber, M.A., Sayyab, M., Abu Fanas, S.H. Oral health status and dental needs of autistic children and young adults. (2011) Journal of Investigative and Clinical Dentistry 2(1): 57- 62. 18. Nurelhuda, N.M., Trovik, T.A., Ali, R.W., et al. 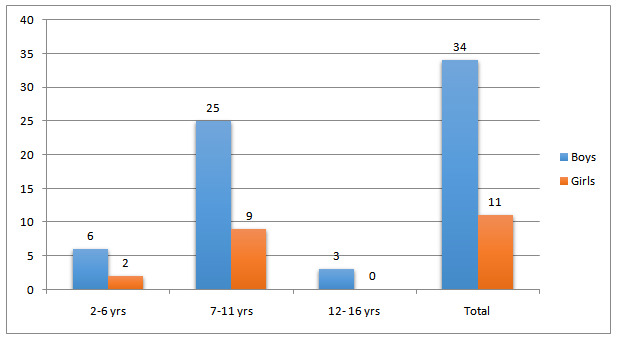 Oral health status of 12-year-old school children in Khartoum state, the Sudan; a school-based survey. ( 2009) BMC Oral Health 9(1): 15- 23.